← Vignette: Listen very carefully, I shall say this only once. La bande dessinée—loosely translated as ‘comic strip’—is a veritable institution throughout French-speaking Europe. Everyone in France (and many in North America) are familiar with the illustrated tales of Asterix the Gaul. Belgian examples include Tintin, the boy detective, and the cowboy, Lucky Luke. 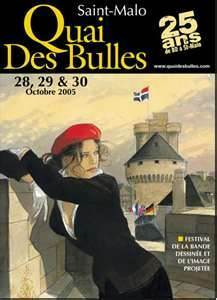 Where better to hold a comic strip convention, a festival de la bande dessinée, than in the medieval setting of the Breton seaport of Saint-Malo. [Side note: Much of the old district was destroyed in 1944 when the German army refused to surrender the town. After the war, the buildings were reconstructed in the original style]. 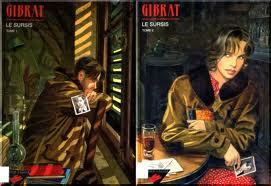 The front covers for volumes 1 and 2 of Gibrat’s BD Le Sursis (The Reprieve) show hero and heroine, Julien and Cécile, pensive, each holding the photo of the other. Cécile is Jeanne’s sister, by the way. The story of Le Sursis in a nutshell: Julien Sarlat jumps from the train transporting him to Germany for obligatory labour and seeks refuge with the aunt who raised him in the tiny French hamlet of Cambeyrac. Allied planes subsequently destroy the train, killing a man on board who has stolen Julien’s identity papers. The man is wrongly identified as Julien, while Julien himself goes into hiding in the empty loft of his former school teacher—and fantasizes about his childhood sweetheart: Cécile. She waits on tables at the Café aux Tilleuls, and Julien watches her, secretly, each day from his vantage point across the street. Gibrat tells it as it was: the black market, the Vichy regime’s much-despised special police force known as the Milice, and shortages—bizarre as it would now appear to the modern-day French—leading to days that were officially designated as ‘alcohol free’. And violence, of course. The daughter of a local garage owner is brutalized by Nazi soldiers, and her father is shot before her eyes. Julien and Cécile must wait for volume 2 of Le Sursis before they become lovers. As the Milice becomes increasingly aggressive in its raids, Cécile decides to leave for Paris (with Julien to follow). Meanwhile, in Paris, Cécile’s sister Jeanne is having problems of her own, having been picked up by the local police and thrown in jail. That is the start of the second of Gibrat’s two-volume sets of bande dessinées, volumes 1 and 2 of Le Vol du Corbeau (The Flight of the Raven)—and story enough for a second post. This entry was posted in Book, Vignette, World War II and tagged bande dessinee, Gibrat, Le Sursis, Le Vol du Corbeau, Milice, Vichy. Bookmark the permalink.